Dormant factories and industrial warehouses began their transformation in the 1970s and 1980s, becoming work spaces and studios for artists and entrepreneurs. What followed was an influx of new businesses, converted factories to luxury condominiums, and the development of new construction multi-unit luxury residences. River North is a hub for creativity and entertainment. 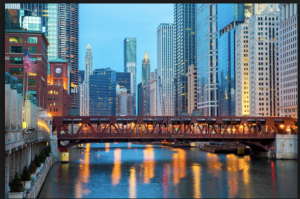 Anchoring the area is the massive Merchandise Mart, with its endless trade showrooms for furniture and design wholesalers, and surrounding this epicenter are eye-catching galleries, home stores and antique shops. Cultured by day, River North shifts into high gear by night. The dining scene is always buzzing-from knockout noodles and Spanish small plates to high-end steakhouses and famed pizzerias. Just about every type of cuisine is covered in this mix of award-winning restaurants and local favorites. And for some afterhours revelry, slip into any of the sleek new clubs, upscale wine bars and craft cocktail lounges that dot the scene.